Last week was the busiest our kitchen has ever been. Testing and testing cake and cupcake recipes and shoppiing and preparing for that weekend party. You know, all those little things you plan and do for a milestone birthday? Yeah. That. I had it all in my head a couple of weeks back. Just a simple birthday party with some popcorn and a few DVDs. But then someone whispered in my ear something that made absolute sense - it is a 10th year birthday sothere needs to be a little bit more than DVD and popcorn. And so, hours and hours of Pinterest browsing happened. There were pom poms to be made, lootbags and decorations to be bought, and a two-weeks-before idea of a Minute-to-Win-It game was thought of. There were cupcakes and cupcakes and cakes baked and eaten even before the weekened kicked in. And all those days of planning and preparation went off in 4 hours. I'd say with lots of happy cheers, fun and laughs. It was all worth it. Check out my IG gallery for some of the photos. Here's a photo of the cakes on the day - Chiffon Cake wtih creme chantilly frosting and honeycomb bits, Chocolate Biscuit Cake with strawberries, Chocolate Cake with pink Italian Meringue Buttercream with raspberries. Now back to blogging and this. A long over due post which was promised weeks ago to some IG friends. A Goldilocks Bakebook recipe for the most-loved Filipino sweet pastry called Ensaymada. Dissolve the yeast in 60ml of the water and add half a teaspoon of the sugar. Let this sit for about 10 minutes until the mixture develops bubbles. In a mixing bowl with the dough hook, place the sifted flour, sugar and salt and mix until incorporated. Add the dissolved yeast, remaining water, eggs and evaporated milk. Mix on medium speed for 2 minutes until the gluten develops - approximately 4-5 minutes. Keep the dough in the bowl, cover with cling wrap and and let it sit for 15-30 minutes at room temperature. Punch down the dough in the bowl to release air pockets. Place dough on your kitchen bench sprinkled with a little flour. 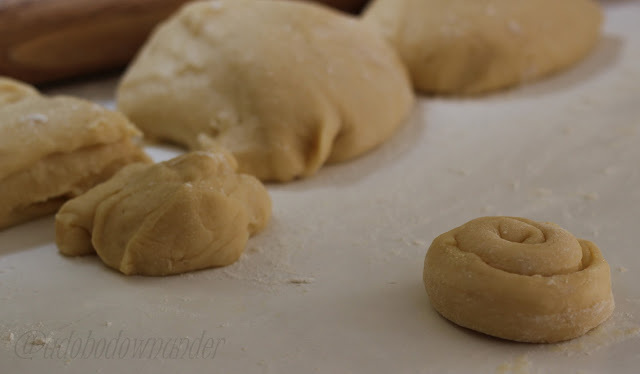 Divide the dough into 4 parts. Then divide into pieces - approximately 50-60g each. Cover with a plastic sheet or tea towel and leave for another 15 minutes. To make the individual rolls, get one piece of the 60g dough and using a rolling pin, roll the dough piece into a rectangle, ideally 8" x 5". Otherwise, as long as you roll them thinly, I don't think the size will matter. Brush the surface with butter. Then twirl into shape, locking the ends to seal. Place each roll into individual greased mini pans (or ensaymada moulds), or simply use a lined round or square pan like I did. Cover with a tea towel and let the dough rise until double in size. Approximately 30 mintues to 1 hour, at room temperature. Bake in a preheated 180*C oven for 15-20 minutes, until golden in colour. Let the bread cool for 10-15 minutes. Brush with butter and sprinkle with raw sugar and grated cheese. * When rolling the dough, make sure your bench top is generously sprinkled with flour to avoid the dough from sticking on the table/bench top. * You can fill the dough with anything. Instead of butter, we tried Nutella and it worked perfectly well. You can use purple yam jam (ube jam) or coconut jam for another Filipino variety. I think I need to be more generous with the Nutella next time. Grated cheese on top! Yummy! To make these Filipino ensaymada rolls is similar to making cinnamon rolls we've made here, sans the cinnamon but different in a way that it's rolled thinly and the bread is soft. What makes it Filipino is the combination of sweet and savoury in the rolls - butter, sugar and cheese for toppings! Where else can you find that combination?! Hope you enjoy yourselves making these. Now, I'm still reeling from that weekend party. We have outdone ourselves with the mess and cleaning up we've made, which only means one thing. The party was a success! All the kids enjoyed playing the challenges, filled themselves with party food and cake! Ooh, and they loved the cakes! Well, I guess the chocolate cakes had the bigger fan base.